When a young Cassandra King Polidori envisioned her professional future, she saw a career that looked a lot like Miranda Priestly’s from The Devil Wears Prada. Fast forward some years, and this fresh-faced, bright-eyed mother to-be has shifted from her journalistic path to be the founder and designer of CassandraCollections, her own line of iconic statement jewelry that has been worn coast to coast by power women celebrities, socialites and artists alike: First Lady Laura Bush, singer Rachel Platten, performance artist Marina Abramović, and the Kardashians (just to name a few). Loved by all who wear her jewelry, Cassandra is known for her creativity and artistry in handcrafting one-of-a-kind pieces that reflect the distinct, individual tastes of their owners. I recently had a chat with Cassandra to learn all about the grit and the grace it takes for her to run her own design business as a one-woman show, and how her background in the arts and her interest in fashion are constantly inspiring her new designs. Where did you go to college, what did you study, and what was your first job when you graduated? I went to Southern Methodist University in Dallas, Texas and double majored in Journalism & Spanish. My first job was as an Editorial Assistant at a Texas women’s business publication called Women’s Enterprise. In your early twenties, what was the dream career you envisioned for your future? In my early twenties, my dream was to someday be an editor at a major fashion publication. Journalism was my passion and I never imagined doing anything else. It’s funny how life changes! How did you get your start designing jewelry? Did you fall into the hobby, or was it something you planned? Because I was glued to a computer at all times, I never wore rings. They were just too uncomfortable to wear when typing. I tried to get into the statement ring fad, but they would end up sitting on my desk or in my jewelry box. I told my friend about my conundrum (I really wanted to wear rings!) and we started to play around with wire. Soon after, we had a prototype for a wearable, comfortable statement ring. So, designing jewelry was never something I planned. I selfishly wanted a ring to wear while I typed all day. It was a hobby that turned into a business, completely organically. What was the turning point in your journalistic career that set you on the path to launching your own jewelry design business instead? At Women’s Enterprise, I interviewed women business owners all day. If I wasn’t interviewing them, I was reading and editing their stories. I was so inspired by each and every woman; many of whom were in male-dominated industries. They had so much drive, passion and gumption! When I realized the rings I was making could turn into something profitable, their stories became my encouragement. They gave me the feeling of empowerment to step out on my own. Is there anything you do in your daily work with CassandraCollections that draws from your journalism skill set? In today’s world most communicating is done via email, so I think my journalism background helps a great deal in that regard. I am a stickler for grammar, so everything in my brand language and written communications must always be perfect. I think my journalism background helps with social media in some ways, but also makes it difficult for me… I had to learn quickly, for example, that incomplete sentences are ok to use on Instagram! From what sources do you find yourself currently drawing your most creative inspiration? I am inspired by so many different things. The other day I was leaving Ballet Austin and there was this fabulous sculpture – I took a picture because I fell in love with the color combo (which you’ll be seeing soon). I also find myself building pieces around outfits, which is so much fun for me since I’m a huge fashion lover. I’d say art and fashion are my two biggest sources of inspiration. What has been the biggest challenge you have faced as an entrepreneur and business owner? Staying motivated! Being a business owner isn’t easy and especially when you’re a one-woman show like me. There are days when I feel like I’m not doing enough and other days where I feel I can’t do any MORE… but, in the end, it’s finding that motivation to keep going and always, ALWAYS believing in yourself. Did growing up participating in the arts influence your career as a designer? If so, how? 100%. I grew up in a very creative family and was encouraged to be involved in as many arts as possible. I studied photography, dance, choir and theatre throughout my entire childhood – I think it’s safe to say I liked performing in front of crowds 😉 So much of my business is talking to people and selling my brand, so I feel I’m constantly pulling from my performance background to tell the CassandraCollections story. Additionally, my photography background has helped me to further appreciate and love the detail of art, and that fine-tuned, developed eye catches inspiration daily. What was your first pinch me moment with the CassandraCollections brand? If you could have lunch with any woman in the world, (living or deceased) who would it be and why? I love that I can say there are thousands of women I look up to and am inspired by, but I think if I HAD to choose just one, it would be Audrey Hepburn. In my opinion, she was not only a brilliant actress and one of the biggest fashion icons, but she was also a dedicated humanitarian. Her work for UNICEF was so inspirational. To me, she epitomized class, beauty and selflessness. Cassandra was born and raised in San Antonio. 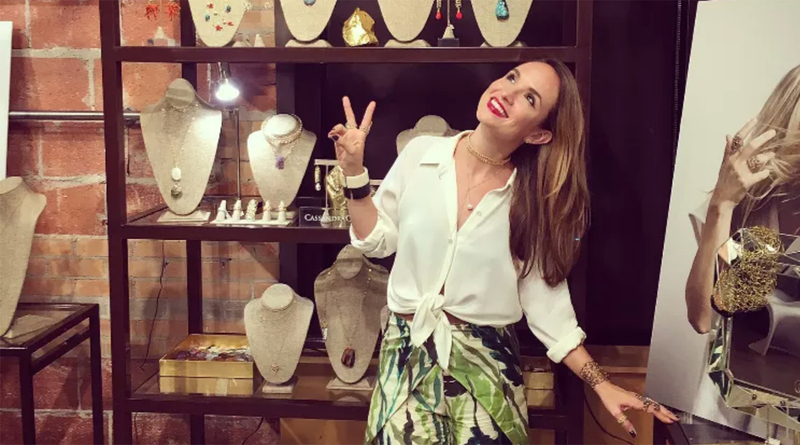 A Texas journalist turned New York jewelry designer, she is now back in the Lone Star State living with her husband Manuel and their soon-to-be first child (a baby girl!). Follow her #girlboss journeys on Instagram @cassandracollections, and contact her here to get started on the design process for your own custom piece!